Plane attempts to land during storm, nearly flips over before pilot successfully touches down. 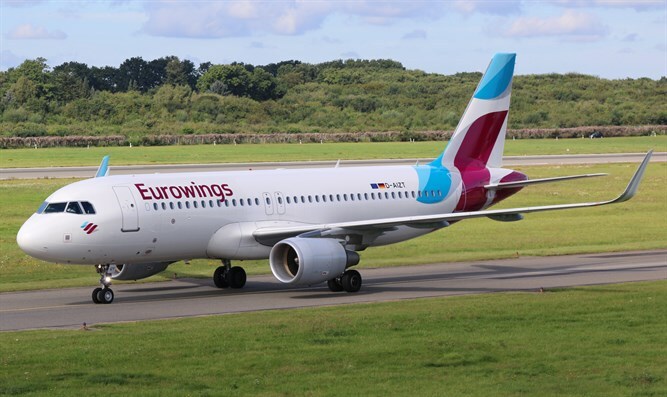 A Eurowings plane landing in Dusseldorf on Thursday shook violently during the landing maneuver due to the "Friederike" windstorm's strong gusts, some of them reaching 68 miles per hour. The plane was nearly tossed upside down before the pilot succeeded in landing it safely. A Bombardier Dash 8. EW 9141, the plane had between 70-80 people aboard on its flight from Westerland, Germany, RT reported. According to DPA, a company spokesperson said, "Eurowings flight EW9141 from Westerland / Sylt to Dusseldorf landed safely in Dusseldorf on January 18, 2018. At no time was the safety of the passengers or crew on board jeopardized." Friederike affected Germany, Belgium, and the Netherlands, with winds becoming as strong as 86.9 miles (140 kilometers) per hour. On Thursday, departures and arrivals in Amsterdam's Schiphol airport were temporarily suspended, affecting over 260 flights around the world. Trains, trams, and buses in Germany and Holland suffered disruptions in service, and the German Insurance Association (GDV) is expected to face claims of 800 million euros ($980 million) after the storm felled trees, damaged homes, and caused traffic accidents.